Azaleas, a member of the Rhododendron family, are shrubs that feature green, glossy leaves and clumps of colorful flowers--if grown under the right conditions. Once the heavy clay, alkaline Texas soil has been properly prepared to accommodate these picky bushes, the azalea has been planted in the soil properly and the appropriate spot to receive afternoon shade to protect the shrub from the Texas sun has been chosen the shrub rewards with showy flowers that require only a small amount of attention to maintain in Texas. 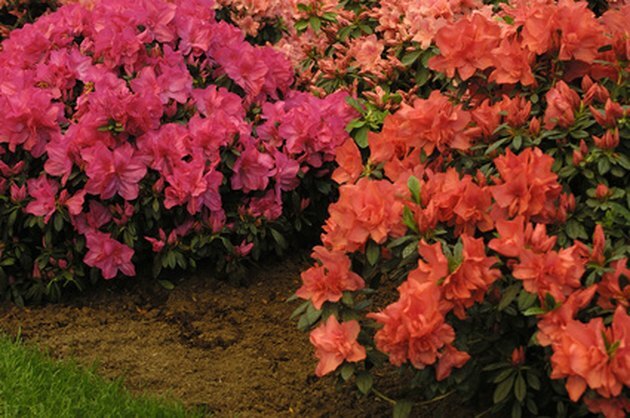 Choose from six available azalea colors to enhance your landscaping. Choose a location where the plant receives afternoon shade, such as the east or north side of your home, to protect the shrub from the Texas sun. Encore azaleas, which bloom in the spring and then again--for an encore--in the fall, are more tolerant of alkaline soils and heat, making them a good choice for Texas. Place ground pine bark, peat moss and sandy loam on top of the chosen planting spot. Mix with the shovel and build a mound about 12 to 18 inches high and about 4 feet in diameter. The shallow roots of the azaleas grow in this well-aerated, nutrient-rich mixture rather than the heavy clay soil of Texas. Spread expanded shale on top of mound until shale is 2 inches deep. Sprinkle five handfuls of fertilizer on the mound. Mix the planting medium with the shovel, maintaining the mound. Place the shrub in the bucket of water and ensure the root ball is completely submerged. Soak until no bubbles rise to the top of the water. Remove shrub and cut the roots vertically in three places using the knife, allowing for new root growth. Push dirt to the side in the middle of the mound. Make a hole almost the depth of the root ball. Place the azalea in the hole, ensuring the top of the root ball is slightly above ground. Push the dirt back around the outside of the root ball, leaving the crown exposed. Mulch the entire mound without covering the crown or allowing the mulch around the trunk of the azalea. Mulch about 3 inches deep. Water well. Check soil around the new shrub every day to ensure soil is slightly damp. Water when soil is dry. When growth of new leaves and flowers is obvious, water the root area well once or twice per week, depending on the weather. Maintain mulch depth for retention of moisture. Azaleas have shallow root systems and dry out quickly in the Texas heat. Prune leggy stems just after flowering to make the shrub dense and compact. Do not prune or fertilize after budding begins around late July. Fertilize after pruning. Julie James has been writing professionally since 2008. Her articles have appeared in several publications including the "Washington Post," VeganCook.com and CosmeticShopping.com. James attended the University of Central Missouri and particularly enjoys writing articles related to home and garden, as well as personal care and beauty.